When Michelle Gagnon's first crime novel, THE TUNNELS, came out in 2007 from MIRA (the mysteries branch of Canada's Harlequin), I flagged it as potentially worth collecting -- a promising start for a career. Her second book, BONEYARD, comes out in July, also as a paperback original. Let's admit it, the PBO is a tough call for collectors, as you can't read it and still have it be in prime condition. Plus it's a caution signal: If a publisher won't go for a hardcover launch, that's a worry. But sometimes a softcover launch is just ... a softcover launch. And I still think, based on the second book, that Gagnon will be as hot someday as the authors who give her cover blurbs: Jeffrey Deaver in particular for this one. FBI agent Kelly Jones slogged her way through a set of messy and frankly terrifying campus ritual murders in THE TUNNELS, and she's back in BONEYARD. Tying the two books together is the way Jones struggles to hold command, not just of the crime scenes but of the crime teams. Far too believable is the constant tension she faces of trying to be a "partner" without getting boxed out of the action for being a woman. 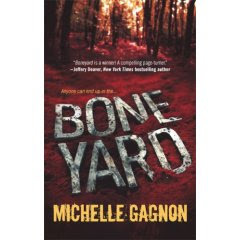 This time, Gagnon places Jones in a consultant role on behalf of the Behavior Science Unit from Quantico: There's been a "boneyard" (the place where a serial killer leaves the bodies) discovered along the Vermont/Massachusetts border where the Appalachian Trail runs along the mountain ridge, and someone's got to go hold the competing police forces together. It's a jurisdiction nightmare that Jones can't control until or unless the kills can be linked to both sides of the state line. And it feels all too realistic when another police team swings into the group, with a corpse found in New York State. While the jurisdiction tangles and the crime teams multiply, Gagnon takes periodic forays into the mind of the killer -- and the oddly angry copycat who tangles the threads further. Chapters skip from inside the crimes to inside the police offices and of course back onto the nearby Appalachian Trail. Gagnon handles the ramping tension fluidly, writing a compelling page-turner. The arrival of Agent Jones's would-be lover, a tough independent character introduced in THE TUNNELS, salts the action with even more gender issues, as rugged Jake Riley calls for the feminine side of Jones, while complicating the jurisdictions even further. Missing from BONEYARD's many strands of tension is one that made THE TUNNELS interesting, the peeling back of the psychological layers of Jones as agent and as victim. As a result, this book doesn't pack as much threat and pain as its predecessor. I was sorry, because I liked that complexity; I'm also a sucker for dark situations that are cracked open through powerful friendships, but the friendships in BONEYARD are a bit more casual, a bit too easy, not tortured or stressed. On the other hand, once I got about three chapters into the book, I wasn't putting it down for much of anything. There's no doubt that Gagnon is getting into her stride, spinning a smooth, plot-driven police procedural with the lab and psych details neatly stitched in place. And although the final chapter had a couple of aspects that I wanted to argue with, it's clearly a set-up for a sequel. Next year, maybe? So here's a "buy it" recommendation for Gagnon's second book. One of these days, she'll break into hardcover and the readers will say "How can this be her first book when it's so good?" Looking for a Summer Writing Program? PMC.